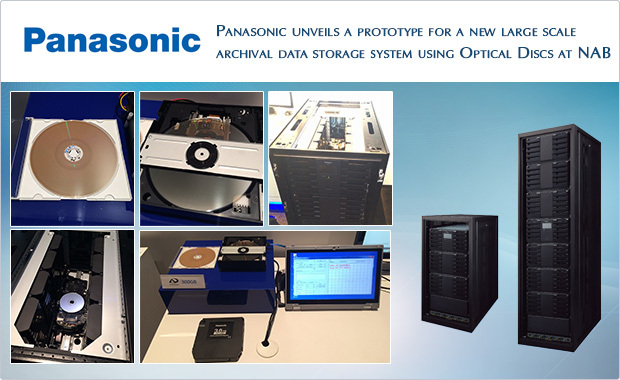 As I wrote previously on April 17th 2015, Panasonic is gearing up for a major improvement on how to archive large scale data using cartridges of high capacity optical discs. Typically digital content is stored on hard disk drives (HDD) and server farms, which require large temperature controlled rooms. Eventually that data becomes â€œColdâ€, meaning that itâ€™s not used frequently or rarely, but it cannot be deleted or discarded. In those cases, Panasonic, amongst others, are looking at ways to archive that data in the most efficient and safest method of storage available today. That method is through very large capacity cartridges of Blu-ray Optical Discs. From the images in the title header, you can see the prototypes of what is intended to be a new offering that will allow companies and individuals to back-up virtually all electronic data on their HDDâ€™s and servers onto optical discs. The reason being is that optical discs are the most reliable and safest method for archiving data today. Yet, as an added benefit optical disc cartridges are also more cost effective to maintain and more environmentally friendly. When thinking about data storage, there are two primary categories; â€œHotâ€ data which is the content that one would use frequently, and â€œColdâ€ data which is content that is seldom if ever used. Typically, old files that are kept for archival purposes or as records, which do not need to be reviewed often are seen as Cold data. When you compare keeping both Hot and Cold data on a server or HDD, those methods take a lot more energy to maintain, in both cooling and electricity to continuously operate compared with the limited requirements needed to maintain and recall data on an optical disc. The hardware requires a lot less energy to function and Cold data can be stored for many years without requiring any energy or risking loss, especially compared with HDDâ€™s. So if large corporations like Panasonic are investing millions of dollars to perfect long term data storage on optical discs, this says to me that optical discs are extremely relevant. So donâ€™t be so quick to toss out your CDâ€™s, DVDâ€™s and Blu-ray discs, I believe they will be a lot more useful over time. For more details about optical discs or duplication hardware, contact a Vinpower Digital representative near you or visit our website at www.vinpowerdigital.com.